It's the Monday after the Super Bowl and it's dark and dreary here. We had a big party last night and I will admit I'm hurting a bit this morning! I didn't do much reading on the weekend, but I did watch two movies that were based on books. The Maze Runner was the first, but I wasn't crazy about the movie. The other movie was This is Where I Leave You and I have to say I laughed as much as I did when I read that book. It was great. I finished reading The Shining and I also finished Gathering Blue by Lois Lowry. Then I started Gooseberry Island by Steven Manchester. I haven't gotten very far yet, but plan to devote more time to reading this week. M, who is almost 8, and I started reading The Lion, the Witch and the Wardrobe by C.S. Lewis. C, who is 10, will start reading The Time Machine by H.G. Wells this week for school. It's pretty gloomy here as well. My son had a tough time getting up for school this morning and I'm not sure whether it was the weather, staying up late last night, or both! 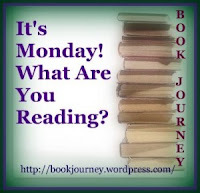 Have a great week and I hope you have a blast reading The Lion, The Witch, and The Wardrobe. It's even more fun when you share it! I hope the skies brightened up for you yesterday. Have a great week! Happy reading this week! I hope The Shining didn't freak you out. Not sure I could handle a book like that. The Lion, the Witch, and the Wardrobe is great, isn't it? I have fond memories of a very long trip by car and playing the audiobook for our sons. I would love to listen to audiobooks on long car rides but the kids always insist on movies. Maybe we'll give it a try next time! I love The Lion, the Witch and the Wardrobe. I actually didn't first read it until I was in my teens then I read the whole series and loved them. My son read it a couple years ago and then read a couple of the other books in the series but lost interest. It will be interesting to see if my daughter ends up reading the whole series. 'The Time Machine' is an amazing book, I hope C. enjoys it! I still haven't read 'The Shining' but don't know whether I will anytime soon because the film terrified me enough as it is! I watched my first ever Superbowl last night and because I live in England I was pretty tired all day from staying up! Hope your next week is filled with as much fun! I never saw the movie The Shining, but I could picture how it could be terrifying. I think reading it is actually less scary since you can imagine things in your mind but aren't seeing them up on the big screen. Have a great week! I'm glad you enjoyed The Shining, but there is no way I will ever read it as I am such a wus about scary/suspenseful reads. I do like you chicken soup recipe! I love those crockpot recipes where everything just goes in without much fuss and bother. That's my favorite way to cook - throw it all in a pot and leave it! Thanks for stopping by and have a great week! I watched The MazeRunner on the weekend too, I quite liked it, I'm wondering if they will make a sequel though. I'm glad you liked The Maze Runner movie. I'm not sure what it was that I didn't like, but it just didn't thrill me as much as the book. I think it may be that I just read the book not too long ago and there were a lot of deviations from it. That always bothers me. Thanks for the recommendation of The Stand. I'd like to read another of his book but wasn't sure which one to choose!